Should I get a New Tile Roof? 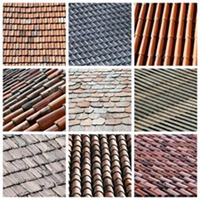 Why Should I Choose Bartile Roofing Materials? When considering a new roof you have many options in regard to style and material to choose from, but remember, not all roofing is created equal. Whether you're building a new home, replacing a damaged roof or conducting home remodeling, it is important to know all your options, especially when one of those choices can outshine the rest. While the initial cost of installing a tile roof can be a bit more pricey than other forms of roofing, the advantages of tile roofing ensure you're topping your house off just right. Tile roofing is designed in a way that makes it more resistant to damage caused by harsh weather over other forms of roofing, such as concrete shingles. This is because the way tile roofing sits on a roof makes it harder for wind and rain to make its way under the tiles and lift them off the roof. Tiles are made out of variety of materials but each of them are fireproof, unlike wood shingles and other materials that can quickly add to the flames during a house fire. Tiles carry a class-A rating in safety. Tile roofing can save you money on your heating and air conditioning bill because of it's ability to insulate a home. It keeps homes cooler in the summer and warmer in the winter. Because it is available in so many styles and colors tile roofing is great for accenting the exterior decor of whatever building it is being installed on. There are also cloaked attic vents, bird stops, apexes and many other accessories available with this type of roofing. One of the best benefits of tile roofing is the beauty it adds to a structure. Tile roofing is available in many different styles, including ones that can replicate wood shingles or slate. It also comes in many different colors, so a homeowner can surely find the right look for their house. Tile roofing can last for many, many decades. In comparison to roofing such as concrete shingles which may only last 10 to 15 years, this is an extraordinary feat. Because tile roofing adds so much life to a home in beauty, safety and longevity, it also adds resale value. If you're looking to install tile roofing in Utah or southern Idaho contact the expert roofers at ProTech Roofing. We will work with you to find the perfect tile roof for your home. Call (801) 691-7720 today to speak with a ProTech Roofing representative about tile roofing in Salt Lake City, Provo, Centerville and throughout Utah.